Last week I went down a rabbit hole and never ended up posting anything. I’m not sure what drove me down this particular hole, but for some reason I started looking into the Wood family…and got sucked in for a number of days. I have several Wood and Woods lines that branch off my ancestral tree at various points, and I am currently under the assumption that they are all quite distinct, un-related families. Wood being a name like Smith, they seem to pop up everywhere. The particular line I have been following this past week appears to be of German descent and I know nothing much about them beyond what I plan to report in this post. You might remember John Abraham McGuffin, my great-grandfather who carried the names of ancestors, John Briscoe & Abraham Seay (as reported in my previous posting)… well, John Abraham married a woman called Edna Wood. Edna’s family doesn’t appear to have been in America for more than a generation or two, but they sure packed a lot of activity into a short number of years. Ann preceded Franklin in death by about 18 years, having reportedly fallen into a newly dug basement for a Methodist Church (being built near her home) while walking in the middle of the night. She died from the trauma of hitting her head. 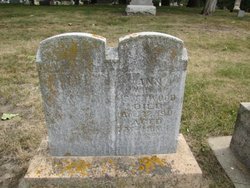 Ann died in 1901 and Franklin’s burial date is given as October 29, 1919. According to an obituary published in the Lake Park News on the 7th of November in 1918, Franklin actually died on October 30th (1918) in the town of Marion, and his remains were brought back to where his wife was buried. They are buried side-by-side in the Okoboji Cemetery in the Great Lakes region of Iowa. After finding Ann’s obituary, I stumbled across the obituary of her son Stafford (accessed through the same Find-A-Grave memorial site), my great-great-grandfather, as published in the Spirit Lake Beacon, Jan 4, 1894. “WOOD – In Tulsa, Indian Territory, Dec. 25, 1893, of congestive chills, Stafford L. Wood, aged 46 years and 6 months. It was about this time I started channeling my own inner Laura Ingalls Wilder… while her family spent time in their Little House in Kansas and Minnesota, eventually heading to South Dakota…mine was in Kansas, Iowa and Wisconsin, and eventually in Oklahoma. Surely they crossed paths once or twice. I wonder how far the Ingalls’ Independence, Kansas home was from the Woods’ Liberty, Kansas home? “Indian Territory”…aka Oklahoma…caught my attention. Oklahoma was always known in my immediate family as the “place my dad went to college”… he was a proud Oklahoma State Cowboy. But we never imagined having further family connections there. Several weeks ago when I was researching in Virginia, I came across some information about a relative named Abraham Jefferson Seay (who is also a descendent of Abraham Seay of Virginia–making us cousins of some sort). It turns out he was the second Territorial Governor of Oklahoma in 1892 & 1893. While Governor, he built a mansion, called Horizon Hill, in order to host dignitaries present for the opening of the Cheyenne & Arapaho Land Run. So it appears, while Governor Seay was entertaining dignitaries in his new mansion, Stafford Wood and his family (not yet connected to the Seay/McGuffin family by marriage) had arrived in Oklahoma looking for their own home. I have yet to locate records of the Wood family from this time period. It’s been quite frustrating–after having this family appear in so many census records up to this point–but Indian Territory does not seem to be a place of great record keeping (or present day digitization). I think a trip to Oklahoma might be in order for some deeper digging. For those of you unfamiliar with the Land Runs…the biggest one, with the opening of the Cherokee Strip, took place on September 16, 1893. This was what was depicted in the Tom Cruise and Nicole Kidman epic “Far and Away.” A great “race” with a gun shot at the starting line and tens of thousands of people running out to claim their piece of a dream. The fact that their youngest daughter Maud is buried in Iowa in 1891 and Stafford dies in Oklahoma in December of 1893, suggests that the Wood family most likely took part in the third land run on April 19, 1892. I haven’t yet found definitive proof…although I have found the name Wood on land patents, but as I mentioned previously, it is a popular name. It has been reported that more than 25,000 hopefuls gathered on a misty April morning to take part in this particular land run. At high noon the settlers rushed in from all directions by foot, race horse, plow horse, wagon, and buggy to stake a claim to their 160 acres. By sunset over 400 lots in the county seat and been taken. By the end of that year, more than 100 homes had been built in the area. While I have made some educated assumptions about when the Wood family arrived in Oklahoma, I have even less information to help me determine when the family left the territory. As we know, Stafford died unexpectedly in December of 1893. Until we are able to uncover more records, we have only one small bit of information to help with this…and that is the birth of a grandchild, a daughter named Vera Wood, who arrived about 1900. Stafford’s wife Lydia is found living in Kansas at the time of the 1910 Federal census. She is listed as head of house and with her are her 34 year old son Arthur (working as a printer) and her 10 year old granddaughter Vera. This census seems to confirm Vera’s birth year of 1900. I don’t have any definitive information on where twin Edith was in 1900. But we do know where her sister Edna was…she was living in Colorado and was likely already married to John Abraham McGuffin. We have yet to determine when and where Edna met and married John Abraham McGuffin- but knowing that the McGuffin family was living in Sugar Creek, Kansas in the 1880’s…chances are it was somewhere in southeastern Kansas. We do know they went to Colorado where John was employed by the National Sugar Company. A quick Google search indicated that the first inhabitants arrived in Sugar City (the town that was built by the company) in 1900. Their first son was born about 1902 (or earlier) in nearby Rocky Ford, Colorado. I haven’t come across John and Edna’s wedding date, but presumably, if Edna is in Colorado, she is likely already married. If you follow granddaughter Vera Wood through several Federal Census cycles you find an interesting progression of her parentage. In 1910 her mother is listed as being born in Iowa and her father as United States, in 1920 both of her parents are listed as being born in Iowa, but by 1920 her mother is listed as being born in Wisconsin and her father in Oklahoma. In these same census records, Vera herself is (always) reported as being born in Oklahoma. My question is, if indeed Edna met her husband John and landed in Colorado by 1900, how could she have given birth to a daughter in Oklahoma at the same time? The fact that twin sister Edith seemingly disappears makes me wonder if she remained in the Oklahoma Territories when the rest of her family moved back to Kansas. Did she die in Oklahoma? Or in Kansas? And when exactly did she die? 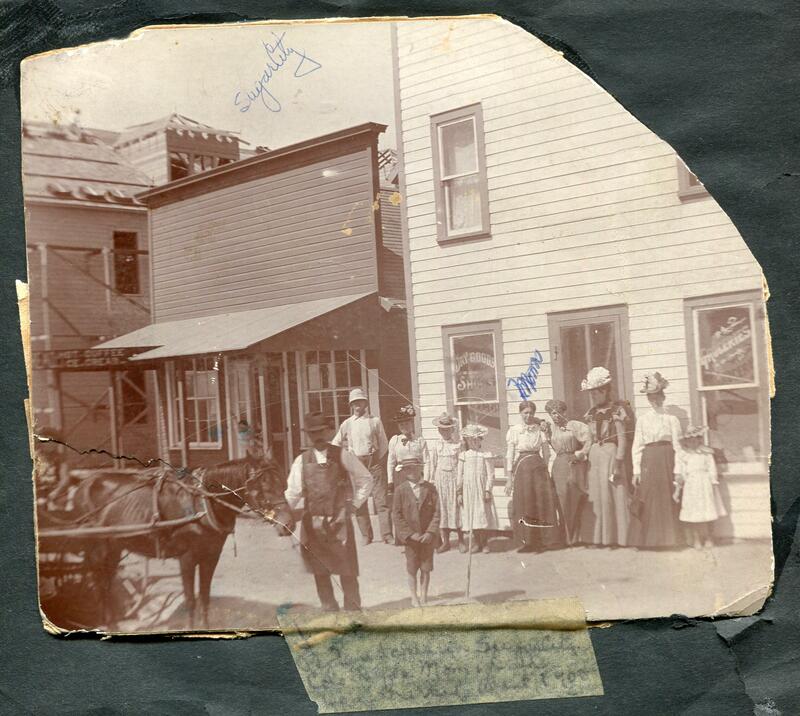 What we DO know is that by 1912, Edna & John McGuffin and their children moved to Scottsbluff, Nebraska when the Great Western Sugar Company built a new factory there. Lydia and granddaughter Vera left Kansas and moved in with the McGuffin clan shortly after. 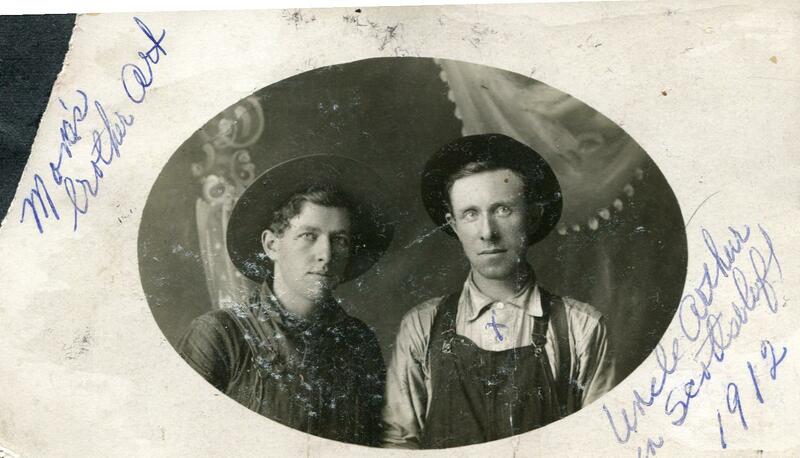 We don’t know if Edna’s brother Arthur moved to Nebraska as well, but we do have a picture of him with a hand-written note stating “in Scottsbluff.” Arthur appears to remain a bachelor and he also disappears from records around 1912. 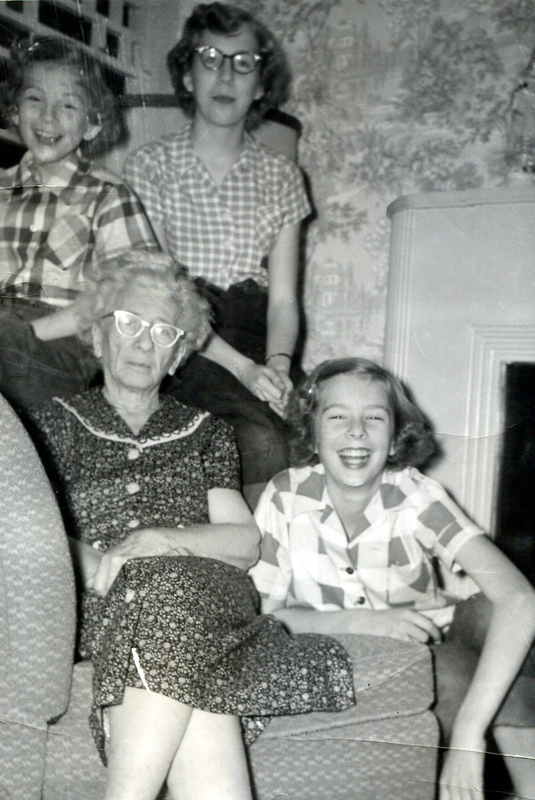 It was one (or more) of Edna’s children who speculated as to whether Vera was actually their cousin or their sister, and this information they passed down to later generations. After her grandmother’s death in 1930, Vera left Scottsbluff and made a life for herself in Albuquerque, New Mexico, where she married and had children of her own. Arthur Wood photographed in 1912 in Scottsbluff, Nebraska. Arthur disappeared from records around this time. We have not yet identified the boy on the left. Every bit of new information I uncover appears to come with at least three additional unanswered questions. I see now that I might be at this for a very long time… (sigh)…I am not sure what rabbit hole I am headed toward next. Benjamin Franklin Wood’s grave indicates that he was born in Germany. The gravestone is unreadable except for Ann’s data. It’s interesting that the inscription for his data wore away when he died a number of years after her. Maybe there was no inscription? Do you think we can have one added/redone? probably just a fluke of nature…perhaps his was carved a bit differently…or the rain just hits from that angle. There is no rhyme or reason. I don’t believe those stones are strong enough to be recarved…you would have to replace the entire thing. So much info is lost when these stones disappear…we are lucky when the headstones inscriptions were recorded or good burial records kept. I was thinking about Benjamin Franklin Wood’s birth place and whether it was Germany or New York. I’m inclined to think it was New York. If he was born in Germany, why would his parents name him after Benjamin Franklin, an American. Also, in the 1880 Federal Census, his parents are listed as being born in New York and Pennysylvania. Wood is not a German name. If the family origninated in Germany, I wonder what the last name was? I agree with you on all these thoughts…and perhaps the note from the burial/cemetery is incorrect? I think the key will be finding out more about BFW’s parents…and until one of us finds a new clue to them…we are left with questions, questions, quesions!! Keep working on it!!! Like you, when I do research I often end up in rabbit holes, but they inevitably are so interesting that I don’t care. Since you took without permission, the headstone photo for Benjamin Franklin Wood, from his findagrave memorial, you may as well copy the obituary I posted on his memorial today. Note dates and places. In the future, please note where you “stumbled” across such items. Keith- diplomacy; take a class on it or read about it in a book. make sure you credit who you learned it from. shakingthefamilytree-your response was mature, heartfelt and the high road. kudos to you. people like you keep the important familial info intact. hey Kristen…it’s ALL good. I had a talk with Keith and he is fine with it all, and I have had many people visit this particular post through Keith’s Find-A-Grave posting. And I promised to be better about tracking my sources 😉 …you know how excited we all are when we find new family information! Thanks for the shout out!